My littlest sister finally opened up her etsy shop... richellephant. My sister is a little artist. She hand paints some of the rings herself and she uses the tiniest little brush to get in all her details. It is definitely a work of art. I have a hard time painting with a big brush, I don't know how she does it with a tiny one! This one is my favorite. Richelle, or RJ as we call her, is inspiring because she is really following her dream. She wants to be a dancer, despite no formal training growing up, so now she is working really hard to be up to par so that she could be a dance major. She is taking lots of dance classes at a local studio and works everyday to strengthen her legs. Dance classes are expensive, so my parents said she needed to get a job. I told her to open an etsy, so now here she is. Give my littlest sister some love and purchase one of her lovely creations. It would make her so happy (me too)! She shows everyone that it is never too late to follow your dream even if comes a bit later in life. Happy Tuesday!!! Will be back later with my polaroid. Cool rings - tell your sister that she is talented! I just started my own business too~ making hand-painted cards~ to follow my dream of traveling to Brazil to study dance next January ~ Follow your dreams! I'll check out her store~ Good luck! good for her!! what talent! very pretty!! i will definitely take a peek. Cute shop! Best wishes to you sister and her dancing endeavors too! Lovely! I just hearted the shop and intend to purchase soon (smile)! Have to support the fellow etsy sellers. i'm SO HAPPY i found your blog! i actually follow richelle's blog but didn't find you via her. but WOW i really adore her and her love for Christ is so inspiring and challenging to me; i'm happy to know you now as well! cool looking stuff. Guess creativity runs in the family, eh? I'm loving your sisters little creations. The pink rose ring is my favorite. It reminds me of a dear, dear friend of mine. 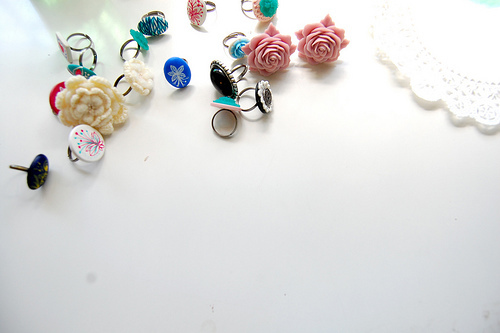 I'm going to have to visit your sister's shop on Etsy and snag that pink rose ring for my friend. I know my friend would love it. Do you think your sister would mind if I posted up her rings and Etsy shop info on my blog? I think a lot of my friends would dig it! My friends looooove accessories! Well... what girl doesn't. Congrats to your little Sis! And big ups to her following her dreams! what pretty things, congratulations to your sis! i started following your sister's blog recently. she is darling, and so is her new shop! good for her! very cool--i will check her out!